“March no more my soldier laddie,There is peace where there once was war. In 1961, singer Andy Stewart put those moving words to a traditional piping tune, The Battle’s O’er, originally composed as a Retreat March in the late 1800s by Pipe Major William Robb of the Argyll and Sutherland Highlanders. A retreat march was played to beckon soldiers back to their company after action for a roll call. Very appropriately, 1,000 pipers will play The Battle’s O’er throughout the United Kingdom and around the world at 6 am on 11th November marking the centenary of the ending of the First World War. Countless towns, cities and communities across the UK are already planning all sorts of events and commemorations, from the most northerly inhabited Scottish island to the most southern, western and eastern towns in England and Wales. Whilst the most westerly commemorations in the whole of the UK will be held in Enniskillen, the Island’s townsfolk were the first to collectively celebrate the end of the First World War a century ago. The historic scoop came because a wireless operator in the town’s military barracks inadvertently picked up a faint signal from General Foch, sent from an aerial on the Eiffel Tower. Foch’s final Allied strategy brought victory in Western Europe’s land-war in 1918 and he was one of military chiefs who signed the Armistice in a railway carriage in the remote Forest of Compiègne, about 37 miles north of Paris. 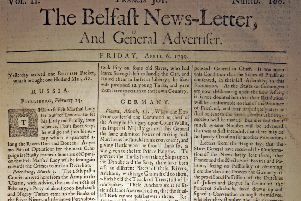 Under the triumphant headline ‘Enniskillen First of All!’ the local Impartial Reporter newspaper boasted “the glad news of the signing of the armistice was known three hours earlier in Enniskillen than Belfast, Derry, Dublin or even in London itself”. The happy news from the Eiffel Tower spread instantly around the barracks, greeted by deafening cheers from the soldiers who quickly emptied into Enniskillen’s slumbering streets. The Fermanagh Times reported “the townspeople knew at once that something of importance had occurred”. Not content with merely shouting about the Armistice, the soldiers from the barracks announced the news using every decibel that they could muster. Amongst the numerous Remembrance Day Services and commemorative community events across Northern Ireland this November, there’ll be a special early morning memorial at Enniskillen Castle at 5.45am hosted by the Inniskillings Museum, before a piper joins with 1,000 other pipers around the UK and the world to play The Battle’s O’er at 6am.